‘Up and down’ pleated blind in great colours, privacy screen without blocking out light, simple to install, no drilling required. 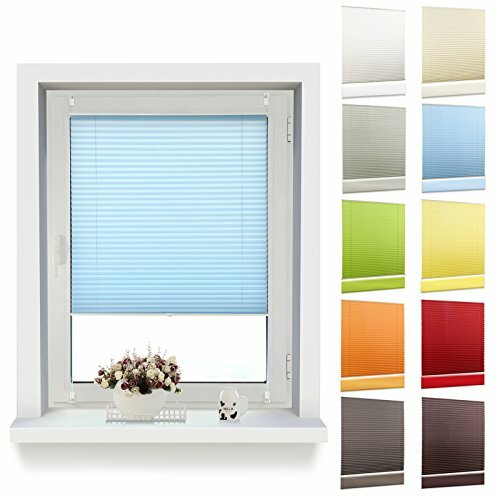 The pleated blind is directly attached to the top and bottom of the window casement, and is freely adjustable. Fully tensioned on the top and bottom of the window frame (no swinging on tilted windows). Rails are made of premium sturdy aluminium and come with operating handles. Pleats and tensioned cords can be adjusted individually to fit the height of the window. Material: 100% polyester (fabric), aluminium (upper & lower rail). Window-mounted, assembly instructions (English language not guaranteed) and fixings included. Don't forget to clean and degrease the surface of the window mounting points. The blind is fitted with adjustable fixing brackets, meaning it is safe to be mounted on most types of windows with varying profile thickness. Suitable for window casement with a fold thickness (including the rubber seal) of up to 24 mm max. The maximum depth of the window frame must not exceed 2.5 cm, and not be below 1.6 cm (without seal), as the clamp brackets are only adjustable within these parameters. 1x assembly instructions (English language not guaranteed).